Michaela Jansen is in the Department of Cell Physiology and Molecular Biophysics, Center for Membrane Protein Research, School of Medicine, Texas Tech University Health Sciences Center, Lubbock, Texas 79430, USA. The activity of the central nervous system is regulated by excitatory and inhibitory molecules called neurotransmitters, which mediate communication between neurons. The main inhibitory neurotransmitter in the human brain is γ-aminobutyric acid (GABA), which binds to several receptors, including the GABAA receptor. Mutations affecting GABAΑ receptors can cause neurological disorders such as epilepsy. GABAA receptors also have binding sites for many other ligand molecules, some of which are widely used therapeutic drugs. Binding of ligands to non-GABA sites can alter communication between different binding sites and affect the receptor’s conformation in ways that stimulate or inhibit its function (allosteric modulation). Writing in Nature, Laverty et al.1 and Masiulis et al.2 report the 3D high-resolution structures of an isoform of the GABAA receptor bound to different ligands in physiologically relevant conformations. Their work sheds light on the intricate network of short- and long-distance crosstalk between distinct binding sites of the receptor, and is likely to stimulate drug-discovery research. The GABAA receptors are a family of protein complexes that span the cell membrane of neurons. They are composed of five subunits (most often two α, two β and one γ subunit) arranged in a nearly symmetric fashion around a central channel. Each subunit has three domains: the extracellular, transmembrane and intracellular domains. GABA binds to the extracellular part of the receptor, at the interfaces between the α and β subunits. This leads to conformational changes that cause the channel to open and chloride anions to flow through. Benzodiazepines — a group of drugs that includes several widely used sedative and anti-anxiety therapeutics — bind to an extracellular site between the α and γ subunits, whereas the transmembrane part of the receptor harbours binding sites for alcohols, anaesthetics and neurosteroids3–5. Laverty et al. and Masiulis et al. used cryo-electron microscopy (cryo-EM) to study a GABAA isoform that contains two α1, two β3 and one γ2 subunits arranged in the order α1-β3-γ2-α1-β3 (Fig. 1 of ref. 1). This is one of the most abundant isoforms of the GABAA receptor in the human brain. Although the receptor’s overall architecture was known, the studies provide new insight into the molecular details of subunit architecture and assembly, location of modulator binding sites and conformational changes initiated by ligand binding. The study by Laverty et al. has three new methodological aspects. First, the authors used full-length GABAA subunits, not the truncated subunits used in previous studies6,7. Second, they reconstituted the receptors in discoidal membranes (nanodiscs) composed of a double layer of lipid molecules girdled by scaffold proteins, an environment similar to their natural cell-membrane surroundings (Fig. 1). This contrasts with the detergent environment that has been used in the vast majority of previous studies of this group of receptors. 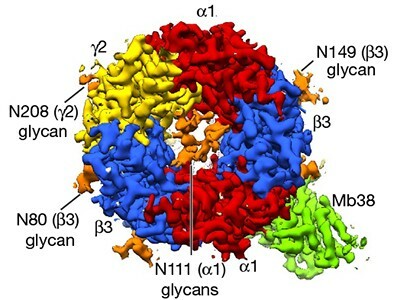 Third, the receptors were coupled to a synthetically enlarged antibody (called a megabody) to aid receptor orientation and alignment during cryo-EM imaging. Using this methodology, Laverty et al. solved the structure of the receptor bound to GABA, and Masiulis et al. solved five additional structures with different ligands or ligand combinations: picrotoxin (an agent that blocks the open channel of the receptor); picrotoxin and GABA; bicuculline (a drug that induces epilepsy symptoms); alprazolam (a benzodiazepine) and GABA; and diazepam (another benzodiazepine) and GABA. GABAA receptors are notorious for requiring a particular lipid environment to undergo functional conformational transitions. Recently, two breakthrough studies6,7 determined the first heterotrimeric GABAA- receptor structures. 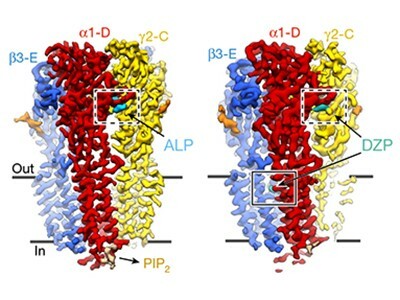 In both studies, the transmembrane domain of the receptor was in an unnatural conformation, which might have been caused by the replacement of the natural membrane environment with a detergent. Given the allosteric nature of the GABAA receptor, any conformational alterations of the structure of the transmembrane domain of one or a few subunits might affect the transmembrane domains of other subunits, and potentially also the extracellular domains. Therefore, the new structures obtained in a membrane environment might be a closer representation of the natural conformations of the binding sites of the receptor. Notably, Laverty et al. demonstrated that their method of receptor reconstitution preserved the physiological long-distance crosstalk between different ligand-binding sites: varying the amount of a given ligand bound to the receptor modulated the binding of a different, radioactively marked ligand to a distant site (Fig. 1f and Extended Data Fig. 2d of ref. 1). 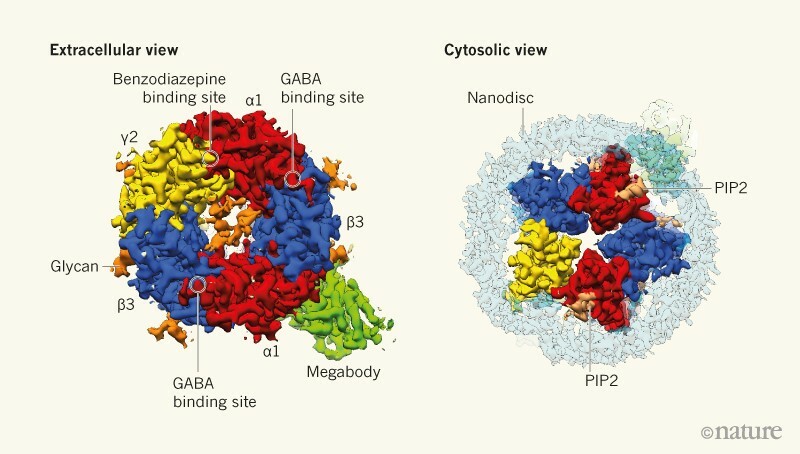 The authors of both studies incubated the GABAA-receptor-nanodisc samples with the megabody to orient the GABAA-megabody complexes during cryo-EM imaging in such a way that snapshots from different angles could be obtained. The use of megabodies might also be a technological advance because it can increase the size of protein complexes that would otherwise be too small for their structures to be determined using cryo-EM. The findings show how the binding of a given ligand to its site leads to conformational and functional changes throughout the GABAA receptor, including changes to the binding sites of other ligands. For example, one structure shows that binding of GABA to both of its sites in the extracellular domain causes a conformational change that contracts and closes these sites (Fig. 3 of ref. 1). Another structure shows that picrotoxin, which binds to the transmembrane domain, stabilizes the receptor in a closed-channel conformation (Fig. 1 of ref. 2). However, a third structure reveals that when GABA and picrotoxin are both present, one of the two GABA-binding sites is incompletely closed (Fig. 2 of ref. 2), indicating that picrotoxin binding influences the GABA-binding sites. Intriguingly, structures obtained when both GABA and a benzodiazepine are present indicate that these compounds strengthen the interactions between the otherwise weakly associated extracellular portions of the α and γ subunits (Figs 5 and 6 of ref. 2). This might explain how benzodiazepines promote the activity of the receptor when GABA is present. The studies also give clues about the cytosolic parts of the receptor. Only short fragments of the large intracellular domains could be resolved, even though full-length GABAA subunits were imaged. This is in stark contrast to the well-resolved structures of the intracellular segments of full-length cation-conducting nicotinic acetylcholine- and serotonin-receptor channels, which are members of the same superfamily of pentameric neurotransmitter channels as the GABAA receptor8–11. The present findings might be the first experimental hint that the intracellular segments of GABAA and other anion-conducting pentameric channels might not have a defined secondary structure, whereas the intracellular domains of cation-conducting pentameric channels are structured even when expressed in the absence of the extracellular and transmembrane domains12. The diversity in length and amino-acid composition of the intracellular domain remains a challenge in the structural and functional characterization of GABAA and related receptors. In theory, the involvement of specific combinations of GABAA-receptor subtypes in particular normal and disease processes holds promise for precise pharmacological interventions. In practice, the large number of different GABAA subunits (19 subunits) that have substantially similar amino-acid sequences renders subunit-specific drug targeting tedious, if not impossible. The detailed structural insights reported in the two papers discussed here, as well as a better understanding of the highly diverse intracellular domain, will probably provide a solid framework for structure-guided drug design and open up new avenues for drug-discovery research. Laverty, D. et al. Nature 565, 516–520 (2019). Masiulis, S. et al. Nature 565, 454–459 (2019). Sigel, E., Stephenson, F. A., Mamalaki, C. & Barnard, E. A. J. Biol. Chem. 258, 6965–6971 (1983). Belelli, D. & Lambert, J. J. Nature Rev. Neurosci. 6, 565–575 (2005). Zhu, S. et al. Nature 559, 67–72 (2018). Phulera, S. et al. eLife 7, e39383 (2018). Unwin, N. J. Mol. Biol. 346, 967–989 (2005). Basak, S., Gicheru, Y., Rao, S., Sansom, M. S. P. & Chakrapani, S. Nature 563, 270–274 (2018). Basak, S. et al. Nature Commun. 9, 514 (2018). Polovinkin, L. et al. Nature 563, 275–279 (2018). Pandhare, A., Grozdanov, P. N. & Jansen, M. Sci. Rep. 6, 23921 (2016).